Halloween, on October 31st, is not a traditional holiday in Hungary; rather, the first day of November, All Saints Day, is celebrated here, as though much of mainland Europe. However, Halloween has been adopted more and more in recent years as, in the west, it has become synonymous with dressing up, celebrating the macabre, embracing the night and having great parties – and if there’s one capital in Europe that knows how to party, it’s Budapest! There are lots of things to do at Halloween in Budapest, from family-friendly free events to spooky special experiences and parties. If you’re in the Hungarian capital at the end of October, here’s our pick of things to do in Budapest around Halloween. 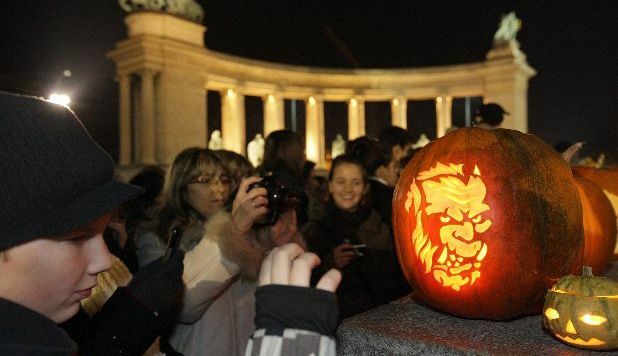 A really cool annual free event started in 2009, is the Budapest Pumpkin Festival in Heroes’ Square. Locals bring their carved out pumpkins to light up the square and create a wonderful Halloween atmosphere. What’s really great though, is this is a charity event and people are asked to bring along some canned foods which are donated to underprivileged children. It’s a very worthy cause, and a fantastic way to experience local community culture as well as contribute in a big way with a very simple gesture, before heading out to party. The date for this year’s event has yet to be confirmed at the time of writing, but it’s usually on the Saturday evening before Halloween, so that would be October 27th, from 19:00 to 21:00. See the event website for confirmation closer to the date. While there is a huge range of city tours in Budapest, from free walking tours to budget guided excursions exploring various themes and topics year-round, Halloween is arguably the aptest time of the year to venture out on a Budapest tour of an, especially spooky nature. Two excellent examples of such tours are Ghost Tour Budapest and The Legendary Vampires of the Castle Courts Walking Tour. 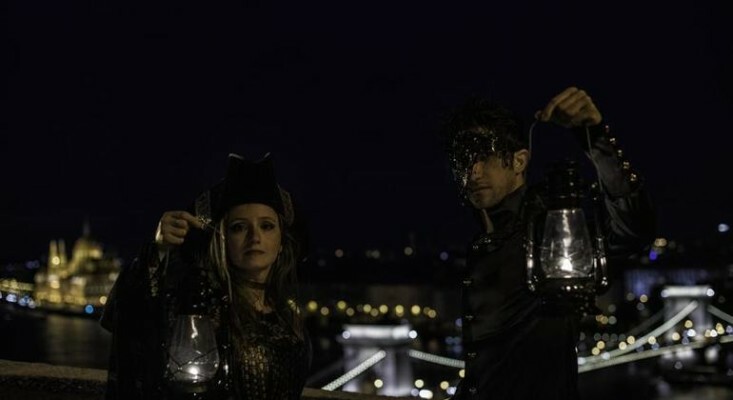 The Legendary Vampires of the Castle Courts Walking Tour is a fantastically atmospheric experience taking you around the fascinating Buda Castle complex overlooking the beautifully lit up Budapest cityscape on the banks of the Danube. The architectural mix of medieval, Baroque and gothic elements throughout the grounds makes for the perfect setting for this night-time tour as your expert guide, adorned in medieval gothic garb, brings Budapest’s mysterious and at times devilishly frightening history, legends, folklore and infamous citizens, such as Vlad Dracula and Elizabeth Báthory, to life with marvellous technique. Advance booking is required to join this tour. 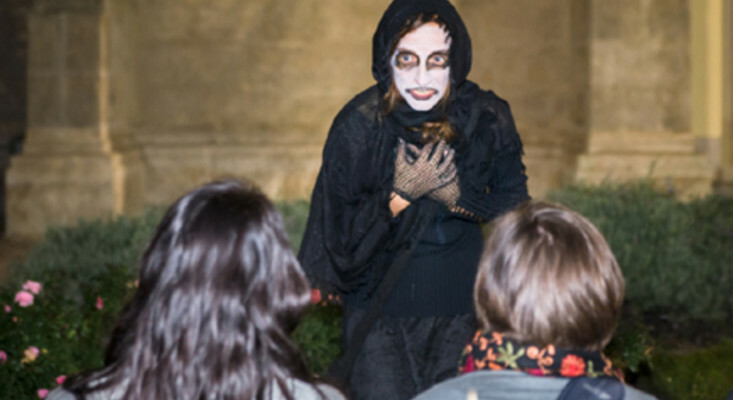 Ghost Tour Budapest is guided by a witch, no less, who will take you slinking through the gruesomely dark side of the city, revealing terrifying true secrets and folk stories of vampires, witches, and black magic. Booking is essential for the Ghost Tour Budapest, it takes approximately 1,5 hours, and finishes in the centre – ideal for jumping straight into a Halloween party! Those of you with a penchant for horror and adrenaline-fueled fear should love this interactive horror theatre on Nagy Diófa Street in which you’ll encounter the stuff of nightmares in “multiple chambers and labyrinths…while constantly bargaining or perhaps running for your life”. Sounds scary! If that isn’t horrific enough, you and a friend could afflict yourselves with the task of “escaping from your grave” in their sinister twist on traditional escape room games. The Nightmare in Budapest team of 'frighteners' make this a terrifyingly enjoyable experience – one in which the prospect of actually dying might feel a little too real, but will leave you feeling so very alive! This is a great way for horror fans to spend a couple of hours anytime, but around Halloween is particularly suited to this unique thing to do in Budapest. Just bring a spare pair of underwear. Partying in Budapest is a year-round activity; at Halloween though, most bars, pubs and clubs get into the spirit by hosting Halloween parties, decorating and adding an element of spooky fun to their venues, while many people don fancy dress and costumes depicting traditional creepy characters from horror fiction and movies, as well as icons of pop-culture. The ideal way to party and get a perfect cross-section of local nightlife is on a Budapest pub crawl, this way you’ll save lots of money and visit five of the best bars and clubs in the city, including famous ruin pubs, with a ready-made gang of new friends. You’ll also enjoy a free welcome pint of beer, free shots in each venue, and free VIP entry to the biggest club in Budapest which boasts five dance-floors and variety of music and where you’ll also get a free long-drink of your choice. It’s a lot of fun, there are party-games and, around Halloween, fancy dress costume is welcome too! 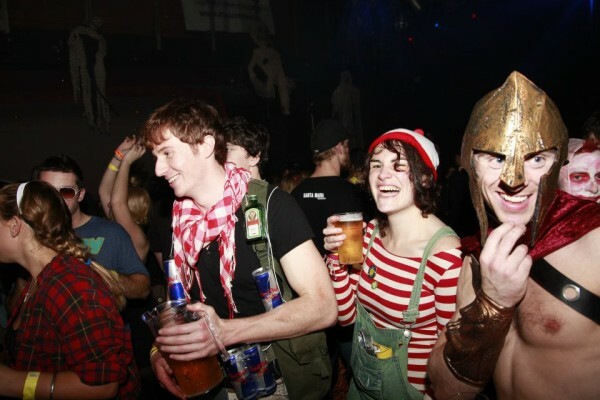 Book your bar crawl online for an exclusive discount price of just €12. Whatever you choose to do, you’re sure to have a lot of Halloween fun in Budapest. Whether you want to be spooked, join in the party, or just chill out and enjoy the special atmosphere of Halloween, Budapest will not disappoint.